AEV was formed in the 1990s when founder and President Dave Harriton started stretching TJ Wranglers for himself and a few friends while a student at the University of Montana. He eventually won a business school award based on this Jeep project, and after graduating Dave set up shop in a one-room garage with a dirt floor in Missoula, Montana. When Dave’s modified Wranglers began winning Chrysler Design Excellence Awards at the Specialty Equipment Market Association (SEMA) show, he found partners in Detroit who could bring OE-quality engineering and manufacturing expertise to his innovative designs. 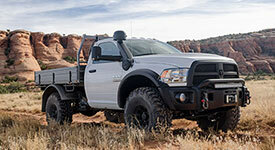 As AEV continues to grow with the introduction of new accessories for the latest Jeep Wrangler and Ram models, and possibly for additional vehicle lines from other OEMs, the company remains steadfast in its dedication to American manufacturing. At AEV, quality is the core value, and for more than two decades AEV’s adherence to this principle has been Proven Worldwide.